This lovely walk is easy for all the family. You’ll often see deer in the fields and in the autumn there are blackberries along many of the hedges. 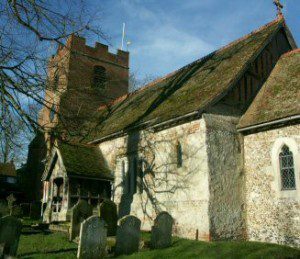 The walk takes you to Rotherwick, with its village duck pond and 13th century church as well as a two country pubs. Download the GPS waypoints (in GPS Exchange format). To download the file to your computer, right-click on the link and select “Save target as” from the menu. 82 m Head towards Basingstoke from the village centre and take the second on the right down Sheldons Lane. 84 m 235°T 129 m 0:01 At the end, take the path and then cross the green and take the footpath next to #37 Middle Mead. 84 m 307°T 304 m 0:04 Follow this down the hill, across Great Sheldons Coppice and down another path near Goose Green. 72 m 349°T 102 m 0:01 When it enters the woods, cross the streams and follow the path with the field to your left for about 500m until it comes to an iron gate. 83 m 001°T 395 m 0:05 Take the path to the left and walk around the field for 500m until the field ends. 79 m 328°T 377 m 0:05 Cross the track and up across the field (you can see Tylney Hall to your left). The path crosses a stile and ends in the left corner of the next field. 90 m 319°T 684 m 0:10 Turn right at the road. 79 m 064°T 378 m 0:05 Pass four cottages on your right after the pub and then turn right down the footpath. Continue on this path for 600m. 75 m 148°T 634 m 0:08 Cross the track and carry straight on into the next field. 82 m 163°T 184 m 0:02 After 650m you go through a stile. 83 m 184°T 501 m 0:06 After 250m, take the signed footpath to the left where the woods start. Immediately turn right into the woods and follow the path by the edge of the woods (with field on left). 69 m 098°T 217 m 0:02 Continue until it comes out and crosses a stream. Turn right along Great Sheldons Coppice. 70 m 202°T 108 m 0:01 Take the first left up Mead Hatchgate. 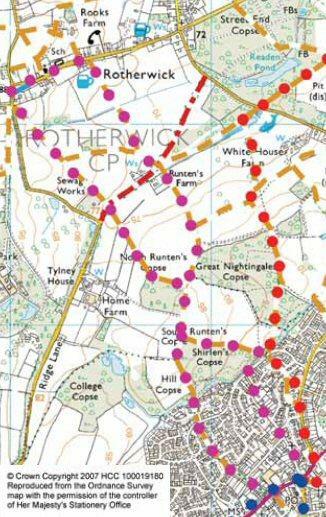 75 m 165°T 77.6 m 0:01 Take the path by #8 into Elms Road and then continue back to Hook centre. 82 m 154°T 456 m 0:06 Hook centre has local shops and three pubs all within two minutes walk: The Raven Hotel, The Old White Hart and the White Hart. Walk from your home, if you live in Hook. By Bus or Train – see the Transport Page for the latest information. Car: A long term car park is available near to Hook centre off Reading Road (opposite the White Hart pub). Note that the free car parks in front of the shops may have time restrictions.